Participants must be 16 years or older on race day, March 24, 2019 to enter the 2019 Skechers Performance Los Angeles Marathon. The Skechers Performance Los Angeles Marathon’s Stadium to the Sea course takes runners from Dodger Stadium across Los Angeles to a scenic finish just steps from the Santa Monica Pier. The course has been measured and certified as to its distance (42.195 kilometers) in accordance with USATF requirements. As the elevation of the finish of the Event is more than 1 meter per kilometer lower than the start and as the finish is separated from the start by a distance greater than 50% of the race distance, performances in the Event are not eligible to be ratified as records. digital clocks are positioned at locations throughout the course. Digital clocks provide the elapsed event time (gun time). Mile markers will be positioned at each mile. Markers will be positioned at each 5km split. Digital clocks at the finish line will display unofficial finish times. The elapsed event time begins with the male elite start. Individuals will NOT be able to pick up Packets on behalf of others. There will be NO race day Packet Pick-Up. Packets will NOTbe mailed to participants. Please make travel plans accordingly, as no exceptions will be made to these rules. Gear Check is located in Parking Lot K at Dodger Stadium. All gear checked at the Start Line will be transported to the Finish Line for pick-up post-race. Participants must use the clear plastic event-issued Participant Bag to check gear. Non-transparent bags, backpacks, or luggage will NOT be accepted. Do not check anything valuable or fragile as the Skechers Performance Los Angeles Marathon is not liable for any loss or damage. Gear Check closes promptly at 6:30 am. Participants will be able to retrieve their checked items immediately after crossing the Finish Line in Santa Monica along Ocean Ave. Gear Check at the Finish Line will close promptly at 3:00 pm. pre-race participant parking is available in santa monica (for those taking shuttles) and at dodger stadium. Pre-purchase options can be found by clicking here. Vehicles parking at Dodger Stadium must enter through the Golden State Gate accessible via I-5. Use the RIGHT lanes leading into the Golden State Gate and proceed to Parking Lots 1, 2, and 3. For vehicle retrieval information, visit our Parking page. Spectator parking in Santa Monica opens in most city-owned parking lots at 6:00 am. To make taking public transit to/from Santa Monica easier on race day, Big Blue Bus will offer all transit service from a single Bus Hub at the 17th St/SMC Expo Line Station. All Big Blue Bus service that operates in Santa Monica on Sunday will arrive/depart from the Bus Hub (except for Route 9, which will not be in service on race day). Marathon runners with a race bib can ride Big Blue Bus for free on race day. Metro will provide a free shuttle between the Bus Hub and the Expo Line Culver City Station for those looking for an easy connection to/from Downtown LA. The City of Santa Monica will provide a Bike Valet from 8:00 am – 6:00 pm at both the Bike Center on 2nd St at Colorado Ave and on Ocean Ave at Tongva Park. What about Race numbers & timing chips ? No one may participate in the Event without wearing the officially issued race number bib registered to the wearer. Participant race number bibs are specific personal identifiers and may not be exchanged or transferred, given or sold to any other person. The sale and/or transfer of race entries/bibs is strictly prohibited and will result in the disqualification and/or banning from future event of any individuals (sellers and buyers) involved. Participants are responsible for verifying that their timing chip is working properly prior to the race and worn correctly during the race. Timing chips can be tested at the pickup location and any problems with the timing device must be addressed at the time of packet pick-up. What about Medical stations — Keck Medicine of USC ? There is medical support at both the Start and Finish Lines as well as along the course. Medical vans are staged at miles 6, 8, 10, 12, 14, 16, 18, 20, 22, and 24. Medical tents are located at the Finish Line and in the Post Food & Fluid Area on Ocean Ave in Santa Monica. A massage tent is also located at the Finish Line. All treatment will be provided by licensed professionals including physicians, nurses, therapists and medical trainers. Twenty-two (22) fully-staffed aid stations will feature both Water and Gatorade Endurance Formula Lemon-Lime. Gatorade Endurance Formula has nearly two times the sodium and three times the potassium of traditional Gatorade. Newly reformulated, it now contains no artificial flavors or sweeteners and has a new, lighter flavor. Participants are advised to continue moving through the Aid Station if the first tables are too crowded to conveniently obtain fluids. 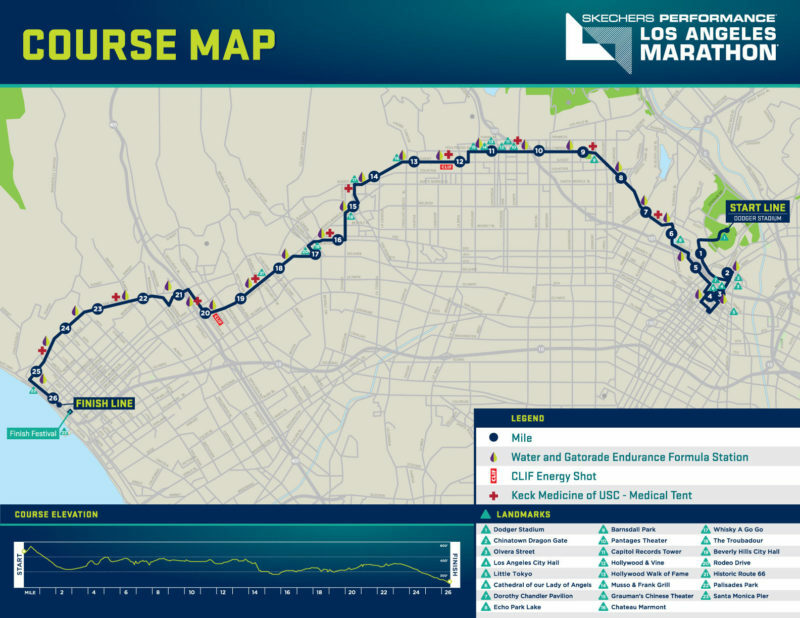 How was Skechers Performance Los Angeles Marathon? The 2018 Santa Monica Classic will take place on September 9th, 2018. Registration is scheduled to open in May and will sell out quickly! Last year, the race sold out two months prior to race day, so mark your calendars for May to make sure you get a spot! The Start Line of the Santa Monica Classic is located just west of Ocean View Park on Barnard Way. Runners will be able to see the Start Line structure as they approach Ocean View Park.